What for decades could only be dreamt of is now almost within reach: the widespread provision of free online education, regardless of a student’s geographic location, financial status or ability to access conventional institutions of learning. Yet for all the hype-cycle that has been entered into over MOOCs, many experiments with Open Education (OE) do not appear to be designed to challenge the becoming business of the university or alter Higher Education in any really fundamental way. If anything, they seem more likely to lead to a two-tier system, in which those who can’t afford to pay (so much) to attend a traditional university, or belong to those groups who prefer not to move away from home (e.g. lower-income families), have to make do with a poor, online, second-rate alternative education produced by a global corporation. Open Education: Condition Critical will thus examine some of the opportunities that exist for experimenting, critically and creatively, with very different ideas of what the university and education can be in the 21st century. In doing so, rather than focusing on the 2012 batch of extremely publicity-savvy xMOOCs (Edx, Udacity, FutureLearn etc. ), it will draw attention to a range of more radical developments in the Open Education arena. They include The Public School, FemTechNet’s DOCCs (Distributed Open Collaborative Courses), the self-organised ‘free universities’ associated with the Occupy, anti-austerity and student protests, and even so-called ‘pirate’ libraries such as libgen.org and aaaaarg.org. 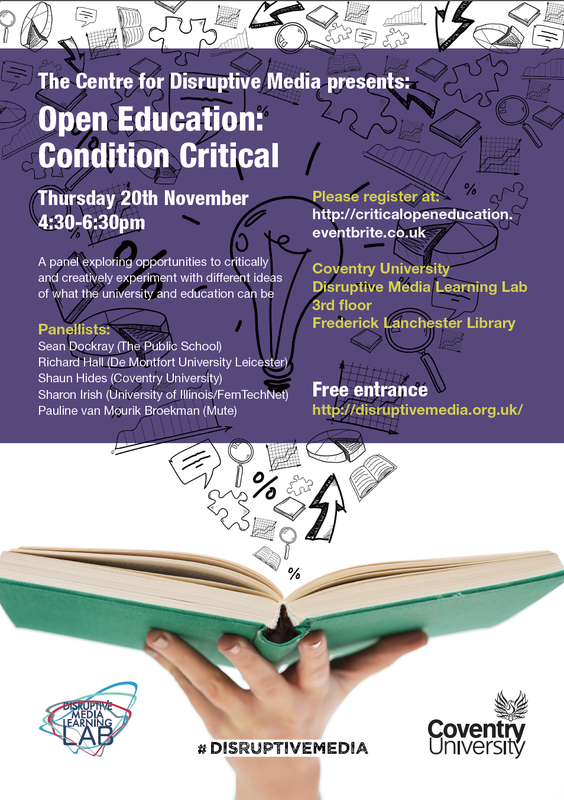 Open Education: Condition Critical has been organised to mark the publication of Open Education: A Study in Disruption (London: Rowman and Littlefield International, 2014), co-authored by Coventry University’s Open Media Group and Mute Publishing as a critical experiment with both collaborative, processual writing and concise, medium-length forms of shared attention.